A period: A dot on the baseline of lined writing paper which is a punctuation sign that is used for a number of purposes including the end of a sentence other than one that ends with a question mark or exclamation point. End stop period: A period that is used at the end of a sentence. Colon: A punctuation mark that consists of two dots or periods placed one on top of the other; a punctuation mark that accompanies a list or a fuller description of an element or elements in a sentence. Analogy: A comparison of two things in terms of some similarity that these two things have despite their perhaps many differences and dissimilarities. Question mark: A form of punctuation that is most often and most typically found at the end of a sentence when the sentence is an interrogatory sentence asking a question. Contraction: The compression of two words into one; an apostrophe is used for contractions. A period, which appears lite a small dot on the baseline of lined writing paper, is used in the English language for a number of purposes. A period is sometimes referred to a full stop when it is used at the end of a sentence. Periods, or end stops, are the most commonly and frequently form of punctuation. Periods end all sentences other than those that are questions or exclamation. The children in the classroom were rather noisy today. I just cannot wait until I have passed my TEAS examination. At long last, I am able to go to bed. I plan on studying all week end. It appears that it will be raining tomorrow. Days of the week like Mon., Tues. and Wed. Months of the year like Aug., Sept., Oct., Nov., and Dec.
As stated above, periods are used as full stops after a sentence other than a question or an exclamation. When an abbreviation ends the sentence and the sentence is NOT a question or an exclamation, the end stop period or the period after the abbreviation or the person's title is not included. This eliminates a double period ( .. ) at the end of the sentence. Tomorrow is the 1st of Dec.
Reverend Pauly is our favorite Rev. Many people fear the I.R.S. Is today Sun. or Mon.? Who is your favorite Rev.? Why do so many people fear the I.R.S.? I have already told you that today is Sun.! He is our most favorite Rev.! Oh, no, we got a letter from the I.R.S.! Are used in lists to separate the items in a list that contains more than three items. This specific type of comma is called a serial comma. Commas are necessary to add clarity to a sentence, to separate a clause and a phrase, and they also avoid ambiguity and confusion in a sentence, clause and phrase. The equivalent of a comma in the written word is a brief pause in the spoken word. Many people use commas too frequently and others use too few commas. Too many commas tend to unnecessarily break up the professional, smooth flow of a sentence, clause and phrase; and, too few commas add confusion and ambiguity to the sentence, clause and phrase so that the reader may not be able to understand and comprehend the sentence. In terms of using commas in a list, the placement of the comma is referred to as a serial comma. Serial commas are used to separate more than three items in a list. When there are two items in a list the items are separated with the word "and" or "or". You can either place a serial comma before the conjunctions such as "and" and "or" in the sentence or you could skip that last serial comma. Both methods are debated as correct and grammatically sound; however, many standardized tests, like the TEAS examination, typically prefer the use of the last serial comma in a list, so it is recommended that you use the last serial comma in a list. Mary, James, Jane, and Tom went to the dance. (Using the last serial comma in this list of four names before the word "and"). As stated immediately above, the comma before the word "and" is the preferred way. Mary, James, Jane and Tom went to the dance. (Not using the last serial comma in this list of four names before the word "and"). This is not the preference in terms of the last serial comma. Are used with some adverbs to separate the adverb from the rest of a sentence. Again, the serial comma after the word "confusion" and before the word "and" in the first list above is the preferred method. Commas are also used to separate two clauses with two different thoughts and also to separate a clause from a phrase in a sentence because each of these has a different thought but they are both included in one sentence. Again, the comma avoids confusion and ambiguity. After I arrived home, I fed the pets. When I arrive at the family reunion, I will have a large number of people to thank and a lot of people to see. She studied hard for the TEAS examination, but she did not pass. Despite the fact that it was cold outside, Mary was still able to take her one hour daily walk. In spite of all hardships, she prevailed with the courage and strength that was needed for this catastrophe. Commas are also used to separate adverbs from the rest of a sentence, particularly when the adverb begins the sentence. Lastly, I will summarize what we have already discussed. Fortunately, we found our lost kitten. In summary, commas are used in several kinds of sentences. Furthermore, this situation was worsened with the angry and hostile exchanges among the attendees. Still, the patient has to make decisions about their plan of care relating to their own diabetes and heart disease. Commas are also sometimes used to separate parenthetical phases and words from the rest of the sentence, particularly when these phrases and words are NOT an essential part of the sentence and NOT necessary for the full meaning of the sentence. When commas are used for this purpose, a comma comes before and after the parenthetical phase to separate it from the other words of the sentence. Again, as stated above, this kind of phrase, which is not really necessary to fully convey the meaning of the sentence, is frequently used in the English language. It was, if you don't mind my saying so, one of the worst times of my life. He is, aside from being highly rude, now returning to his wife. Mary, as luck will have it, won the door prize. Taylor, as you can probably guess, was late again. It had to be, despite my protestations, one of the worst conversations that I have ever had. Commas are also used to separate adjectives in a sentence. As you should recall, adjectives are the part of speech which specifies, describes, and gives a fuller meaning to noun and pronouns. He is industrious, kind and generous. Kind, generous, and industrious are the words that most aptly apply to Jason. The friendly, pretty, and playful kitten was a rescued animal from a local shelter. Grammar in the English language is often difficult, confusing, and tedious. Look at that colorful, distinctive, and magnificent exotic bird. Commas are required before a direct quotation in a sentence to separate the direct quotation from the rest of the sentence. Mary said, "I am in complete shock and utter disbelief." After their first date, he said, "I would like to go out with you again." Before the day of the family reunion, Henry said, I feel like I have the flu." I just cannot remember who said, "Give me liberty or give me death." Joan, it was patriot Patrick Henry who said, Give me liberty or give me death." Commas are used to separate the names of geographic names and states, such as those listed below. 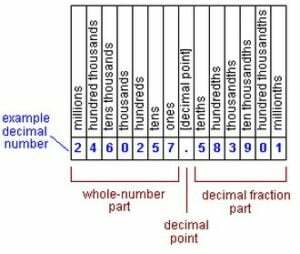 Commas separate number greater than three digits as well as numbers with many more than three digits. The commas used for this purpose separate the places of multiple numbers, as you should have learned in previous Mathematics section of this TEAS review. These commas separate every three digits in a number to provide clarity to positional notations. Commas also separate surnames, or last names, from first names when the first and last names begin with the surname and end with the person's first name, such as is seen in computer generated spread sheets and in writing. For example, Mary Jones is NOT separated with a comma, however, Jones, Mary is separated with a comma. Finally, commas are also used with vocatives. Vocatives are pronouns or nouns that are used when the speaker or the author is speaking to or addressing the person who is the noun or pronoun. A semicolon, like a comma which is placed internally within a sentence to separate parts of a sentence and unlike an end point form of punctuation, such as an exclamation point, a period or a question mark at the end of a sentence, a semicolon is placed internally within a sentence to separate major parts of a sentence. African nations, in addition to others, are: Uganda; Nigeria; Egypt; South Africa; Seychelles; Mayotte; Burundi; and Burkina Faso. Semicolons are used in a serial list of people, places and things when the items or persons when another form of punctuation, like a comma is necessary in that serial list. Ellen, the oldest of the three siblings, prefers fruits over vegetables; Sam, the middle child in the set of the three siblings, prefers vegetables over fruit; and, May, the youngest of the three siblings, does not like either. Patrick, the college hockey player, went on the school trip; Christopher, the college's star basketball player, was not able to make this trip. Botany, which is a special type of biology, addresses plant life; quantum physics, which is a special type of physics, is highly difficult and challenging; paleontology, which is a special type of geology, studies fossils and the geological eras. Mary, who is a sophomore in high school, plans on going to college after high school graduation; Jane, who is a junior in high school, plans on attending a vocational school after high school; Thomas, who is a senior in high school, plans to go to work after high school. Descriptive statistics, a special type of statistics, includes things like measures of central tendency; inferential statistics, also a special type of statistics, includes things like ANOVA and multiple regression. Ian, who finished first in his graduating class, was the valedictorian at graduation; Taylor, who finished second in her graduating class, was the salutatorian. Semicolons are used in end notes and in text notes and citations, according to many formal writing styles such as the American Psychological Association (APA) formal writing style and the Modern Language Association (MLA) style (MLA) formal writing style. Semicolons are used to substitute for and replace a period, or the end stop, when a quotation links two separate independent clauses. "What time tomorrow? ", Nancy asked; "is the family reunion; I do not want to miss a minute of it." "It looks like it may rain this afternoon", Jack said; "so we may not play that baseball game scheduled for today." "It is so important to keep my Sundays open", Tina said; "it is the only day that I have to spend the entire day with my family and children." To connect two or more independent clauses in a sentence when there is no connecting conjunction. May is tall, Mary is short in stature. Tammy really enjoys art, Chris really enjoys science. May is tall; Mary is short in stature. Tammy really enjoys art; Chris really enjoys science. To separate items in a list when another form of punctuation, such as a comma, is needed in the sentence. Baseball is really fun: It is fast moving, which I like, it is mostly held outdoor, which is refreshing after a long winter, it is known for hot dogs and beer, which I enjoy immensely. Botany, which is a subdivision of biology, paleontology, which is the study of fossils, and trigonometry, which is a subdivision of mathematics, are my strongest subjects in school. Baseball is really fun: It is fast moving, which I like; it is mostly held outdoor, which is refreshing after a long winter; it is known for hot dogs and beer, which I enjoy immensely. Botany, which is a subdivision of biology, is rather boring; paleontology, which is the study of fossils, is highly interesting; and trigonometry, which is a subdivision of mathematics, is my strongest subject in school. "Today is my birthday", Macie said, "I am having a big birthday party on Saturday." "What do you think? ", Tom asked, about the Yankees trading that great baseball player"
"Today is my birthday", Macie said; "I am having a big birthday party on Saturday." "What do you think? ", Tom asked; about the Yankees trading that great baseball player"
Colons are the punctuation mark that, as shown above, consists of two dots or periods placed one on top of the other in a vertical manner as shown above. Colons, similar to other forms of punctuation, are not typically detected with the spoken word, however, they allow a reader of the written word to be alert to the fact that information following the colon lists or more fully describes an element or elements in a sentence that follows the colon. The information prior to a colon and each of the separate thoughts following the colon must make a full sentence with appropriate punctuation, although it is permissible to capitalize the first letter after a colon which is not acceptable when a colon is not used, unless of course, it is a proper noun. Colons used in a list are shown with the list above. The traditional elements of Christmas include: A Christmas tree, Santa Claus, presents, greeting cards, and Christmas carols. Colons are also used when multiple explanations are used in a sentence. These multiple explanations follow a colon. It was a wonderful weekend: The weather was great, the sun was shining, and the picnic was fabulous. Our family enjoyed the day: The food was great and everyone had a great time. The keys to success are relatively simple: Stay focused on a goal, set realistic goals, and then plan to move closer and closer to the goal. The Cinco de Mayo festivities were full: The food was plentiful, the music was great, and all of the people had a wonderful time. The genres of writing are numerous: Expository writing, persuasive writing, narrative writing, and others. Similar to the above use of colons with explanations, colons are also used when there are multiple descriptions. The store's grand opening was: entertaining, crowded, and fun. The car's features were: a backup camera, Bluetooth, and a GPS. The themes of the event included: patriotism, charity, and Gold Star families. The Cinco de Mayo festivities included: Mexican food, Mexican music, and dancers. The latest eye shadows are: blue, turquoise, and purple. Examples of colons, used for definitions, are shown below. I had to look up the definition of gregarious: very talkative. I suggest that you learn the meaning of compliment: a favorable comment. Now, it is time to learn about the meaning of complement: a thing that completes a whole. 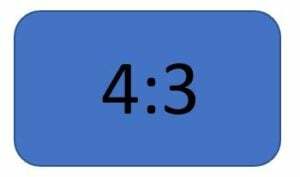 Colons are placed In mathematical ratios between the two numbers in the ratio as shown above and shown below. Many publications, Including book titles and subtitles as well as article titles, can use colons in their titles. Here are some examples of publications use colons in their titles. Colons are also used to separate units of time such as separating hours from minutes and to separate hours, minutes and seconds. Lastly, colons are used to separate the words in an analogy. Simply stated, an analogy is a comparison of two things in terms of some similarity that these two things have, despite their differences. For example, the analogy, "Bird : Airplane" suggests the fact that a bird and an airplane have at least one similarity despite their many differences. The similarity that exists with both the bird and the airplane is that they both fly. Some of the many differences between a bird and an airplane are that one is living and the other is inanimate, and one is large and the other is small. Analogies are often used as test questions for standardized tests. These test questions require that the test taker think about the similarities of two things and then build another similarity for a third word. As you will see below, one colon is placed between the two things and a double colon is used to indicate some equivalency when you are solving analogy problems. A question mark, as a form of punctuation, is most typically found at the end of a sentence when the sentence is an interrogatory sentence asking a question. The question mark, in this capacity, replaces the period or end stop at the end of the sentence in the English language. In other languages, like Spanish, for example, the question mark comes both at the beginning of the sentence and at the end of the sentence in order to alert the reader to the fact that a question will be following the question mark at the beginning of the sentence. In addition to using a question mark at the end of an interrogatory sentence, question marks can also be used at the end of a clause or a phrase when some form of questioning is used. In this situation, the question mark is used to replace and instead of a comma. Here are some examples of interrogatory sentences with question marks. Is it time to go to school? When do you expect to see her next? Who is that person who is starring in that new movie? What is the definition of an analogy? Here are some examples of interrogatory clauses and phrases that have question marks. A contraction, simply defined, is the compression of two words into one. An apostrophe is used for contractions. Here are some examples of the use of an apostrophe for contractions. The use of an apostrophe for the possessive form of words, like nouns and some pronouns, is perhaps one of the most commonly and frequently occurring uses of an apostrophe in the English language. As you should recall from a previous section, possessive nouns are those noun that convey the meaning of a noun as one that has, owns or possesses something. These possessive nouns can include singular or plural as well as collective nouns. For example, girl, girls, and crowd are singular, plural and, collective nouns, respectively. Here are some examples of singular, plural and collective possessive nouns used in sentences. Possessive pronouns are managed differently than nouns taking on the possessive form. Many, if not most, possessive pronouns do NOT need an apostrophe or an apostrophe with an S following it because they are already in the possessive form. Because these pronouns are in the possessive form no apostrophe or S is required. PLEASE NOTE: The word "its" without an apostrophe is the possessive pronoun and "it's" is a contraction that means it is. Be very careful to avoid this common error on your TEAS examination. There are times when a sentence contains two nouns, both of which are in possession, but one is singular and the other is plural. Mary's children and the Jones' children played in the park all afternoon.It is necessary to place an apostrophe after both Mary and Jones because Mary is a singular noun and the Jones is a plural noun. Thomas and Mary's childrenIt is NOT necessary to place an apostrophe after both Thomas and Mary because both Mary and Thomas are singular nouns. The use of an apostrophe for indicating the plural form of characters, such as letters, is shown in the list below. 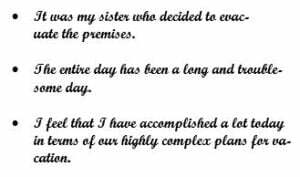 The use of an apostrophe is also used when units of time and money appear in a sentence, phrase or clause. An exclamation marks, or an exclamation point, has limited use in the English language. Experts in term of grammar suggest that the use of an exclamation mark should be judicious and limited. It should only be used when it is necessary to differentiate among other sentences, other phrases and other clauses when extreme emotion is being conveyed to the reader. Conversely, the over use of an exclamation mark dilutes and minimizes the strong emotions that should be attached to exclamation marks. So, do NOT overuse them! Some of the extreme emotions that can be conveyed with an exclamation mark include extreme anger, extreme shock, and an extreme warning when danger is imminent. Exclamation points are most often used to convey extreme anger. Although a hyphen is almost identical to a dash and to a minus or negative sign in terms of its form, a hyphen is different from a dash, a minus sign, a negative, as contrasted to a positive (+), in terms of its usage and meaning. Additionally, a dash is a little bit longer than a hyphen but the same as a minus sign and a negative sign. Hyphens, as a form of punctuation are used to join words together, such as when a prefix or suffix is attached to a word, and also to separate syllables in a word when they cannot all fit on the same line, which is a rare occurrence at this time because of the widespread use of word processing programs. Hyphens, as a form of punctuation are rarely, but sometimes, used to join words together, such as when a prefix or suffix is attached to a word. Since the advent of word processors and computer programs such as Word, the use of a hyphen to separate syllables of a word are very rare indeed because these technologies move entire longer words to the next line automatically when they are too long to fit on a line. This automatic movement is not done, however, with the hand written word using a pen or pencil and paper. It is the author who must accurately separate syllables of long words so they can begin on one line and end on the next line when a word is too long to properly fit on a single line which occurs as a matter of necessity when margins must be strictly adhered to. Dashes, when compared and contrasted to hyphens, are slightly longer in length than a hyphen and they have different uses and purposes in the English language. Dashes, although considered a punctuation sign, do not play a unique role in the English language. In fact, the majority of dashes are the result of substituting a dash for another form of punctuation such as a comma, a colon, a semicolon, and three dots (…) in succession. A sentence using a comma: That is the culprit, it's her. The identical sentence using a dash: That is the culprit - it's her. A sentence using a colon: It was superlative: meaning it was the greatest. The identical sentence using a dash: It was superlative - meaning it was the greatest. A sentence using a semicolon: The sunset was magnificent; it will be a long time before we see another one like it. The identical sentence using a dash: The sunset was magnificent - it will be a long time before we see another one like it. A sentence using three dots in succession (…): Alas… it is over. The identical sentence using a dash: Alas - it is over. In addition to substituting for other forms of punctuation, dashes are also used for dates and to credit an author for a direct quotation from a publication.